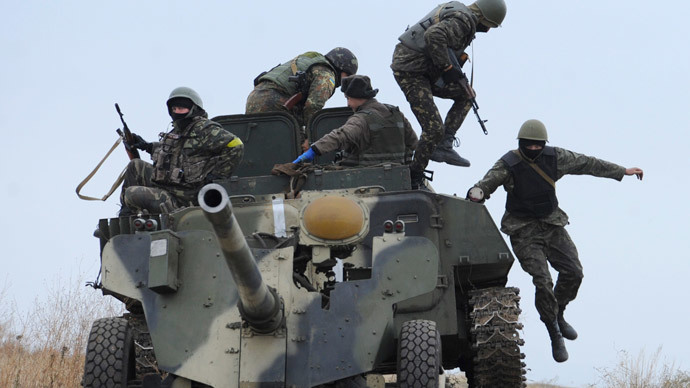 The Ukrainian military draft for 2015 has come into effect. It’s expected to see 100,000 people joining the army in three stages throughout the year. The self-proclaimed Donetsk republic says the process is undermining peace agreements. The first stage of the draft, starting on Tuesday, will last ninety days and will seek 50,000 recruits. Two more stages will follow in April and June. The main aim of the mobilization is said to be replacement for those on the front line in eastern Ukraine, who were recruited last year. Those eligible for draft are primarily reserve servicemen aged from 25 to 60. They are supposed to get a month of training before they actually go to the battlegrounds in eastern Ukraine. Women – mostly nurses and psychologists - are also subject to mobilization, according to the law signed by President Poroshenko on Monday. Joint Staff spokesman Vladimir Talalay has warned those dodging the draft could face up to five years behind bars. The threat hasn’t prevented Ukrainians from venting their anger online at the draft campaign. Many argue mobilization is only possible after martial law has been imposed in the country. The military campaign in Ukraine’s east is officially dubbed an anti-terrorist operation, which people believe is something security forces are supposed to deal with. Last year saw three waves of mobilization in Ukraine. Each was accompanied by massive protests from the draftees’ relatives. Online offers of help to those wanting to avoid army service have also been rife, ranging from legal advice to selling fake medical certificates. The self-proclaimed republic of Donetsk has already slammed the new Ukrainian draft as inconsistent with the peace agreements signed in Minsk in September. The draft comes into effect as Ukrainian troops continue their massive assault on militia-held areas It started on Sunday in accordance with a presidential order. Donetsk authorities have confirmed that two people died as a result of shelling on Monday, with the bombardment continuing throughout the night. A hospital in the city was severely damaged when at least two shells struck it. On Tuesday, an Emergency Ministry station was shelled in Donetsk and a nearby kindergarten was damaged, reported RT’s Roman Kosarev, who is currently in Donetsk. In a video by RT’s Ruptly news agency, loud artillery fire can be heard on the city streets as men in camouflage call on passers-by to get down. Another video shows a dead, old man lying on the ground. Amnesty International earlier called on both sides to protect civilians in conflict zones. The human rights group added that self-defense forces must not launch operations from populated areas, while Kiev has to stop its indiscriminate shelling of residential blocks. On Tuesday, the International Committee of the Red Cross (ICRC) issued a similar call, saying the intensified fighting in and around Donetsk was hampering the ICRC mission there. The Ukrainian Security Council accused Russia on Monday of sending troops across the Ukrainian border. The security officials said two battalions had crossed the frontier, and promised to provide proof. Moscow has dismissed the accusations as absurd. “Yesterday’s claims by Kiev of alleged Russian troops movement over the Russia-Ukraine border don’t stand any criticism. That’s absolute nonsense,” said Igor Konashenkov, spokesman for the Russian Ministry of Defense. Russia is already doing everything possible to help stop the war in eastern Ukraine, the spokesman for the Russian President, Dmitry Peskov said, stressing that Russia cannot solve this internal conflict. While urging the Russian president to solve a crisis in a neighboring state, the West is trying to portray Putin as being part of the conflict. They are trying to isolate him in the international politics, weaken Russia economically and achieve regime change, he said. Moscow believes the escalation of violence might make the so-called “Normandy format” peace talks problematic. The peace talks aim to bring the leaders of Ukraine, Russia, France and Germany together at the negotiating table. The Russian embassy in Berlin confirmed to RT that a Normandy format meeting would take place on Wednesday. Foreign Minister Sergey Lavrov will represent Russia.